Preheat the oven to 180C/350F/Gas 4. Butter a 2½ litre/4½ pint shallow ovenproof dish – a lasagne dish is ideal. Put the butter, sugar, treacle and syrup in a medium saucepan. Melt together over a low heat, stirring regularly until the sugar dissolves. Increase the heat a little and simmer gently for a minute, stirring. Remove from the heat and leave to cool for five minutes. While the butter mixture is cooling, put the flour, bicarbonate of soda and spices in a large heatproof mixing bowl. Add the grated ginger and chilli and toss lightly together. Make a well in the centre. Pour the batter into the prepared dish. Bake in the centre of the oven for 35-40 minutes, or until the cake is well risen and a skewer inserted into centre comes out clean. 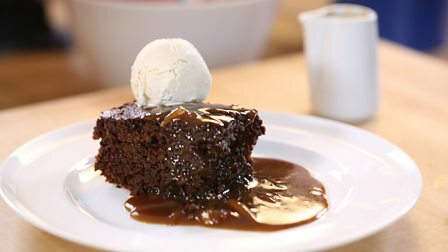 While the sponge is cooking, make the toffee sauce. Put the ginger balls on a board and slice thinly. Pile the slices from each ball up and cut through them to make thin matchstick strips. Scrape off the board into a medium non-stick saucepan. Add the cream, sugar and butter to the stem ginger matchsticks and place the pan over a low heat. Cook together, stirring until the sugar dissolves. Bring the sauce to a very gentle simmer and cook for 30 seconds more, stirring constantly. Take the pudding out of the oven and pour the hot sauce over the top, spreading the ginger pieces over the surface with a spoon. Serve topped with well-chilled crème fraîche or scoops of ice cream and a sprinkling of finely grated lime zest.